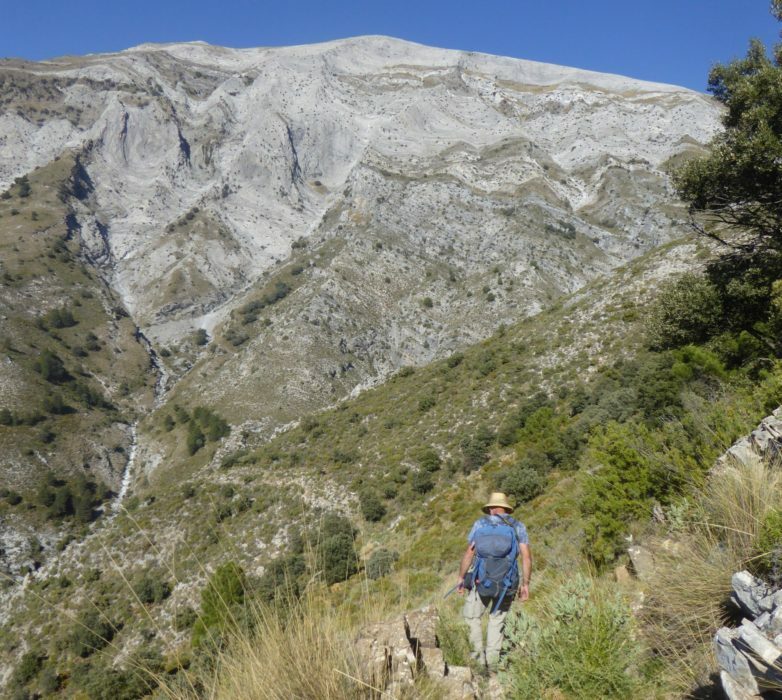 Guy Hunter Watts introduces the Andalucían Coast to Coast Walk - from the early days of planning and designing the route to the completion of this 21-day trek through the Spanish mountains. I first discovered the mountain trails of Andalucía during a university spring break in the early Eighties. The train journey south through France and Spain turned out to be an auspicious start to my Iberian adventure. On the leg south from Madrid hundreds of young Spaniards were returning home after completing their military service, still an obligatory rite of passage in those days. In a carriage designed for eight, I spent the night with around 20 young men, sharing laughter and bottles of cheap red wine. 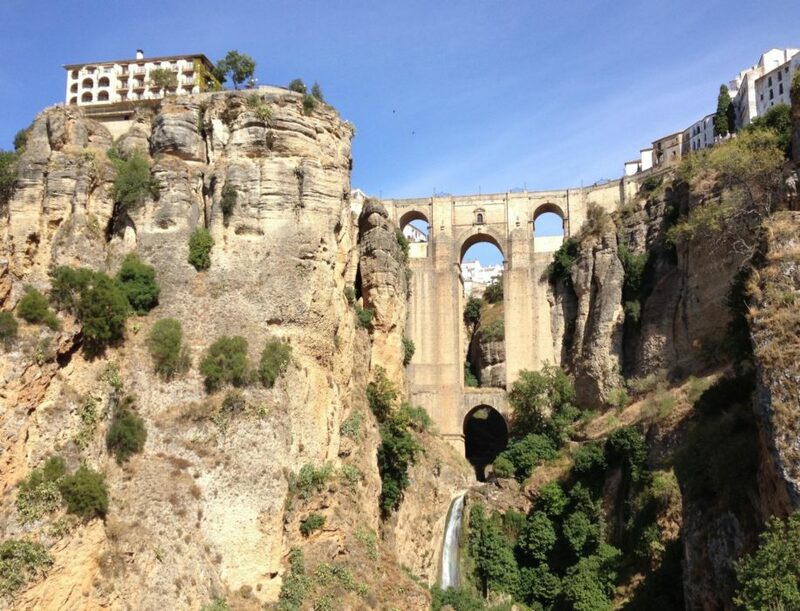 After witnessing the remarkable Easter parades in Sevilla and Córdoba, I headed for the sierras west of Ronda. This remarkable belt of mountains had been on my walking radar since reading Alastair Boyd’s delightful travelogue, The Road from Ronda, which described a long ride on horseback through Andalucía. Little did I know then that, years later, Alastair would become a dear friend. The beauty of the mountain terrain took me by surprise, as did the easy manners of the folk I was meeting along the way. In crowded bars, lively restaurants and those sell-everything village shops that reminded me so much of my childhood, an idea was beginning to crystallise: this could be a place where I might one day put down roots. 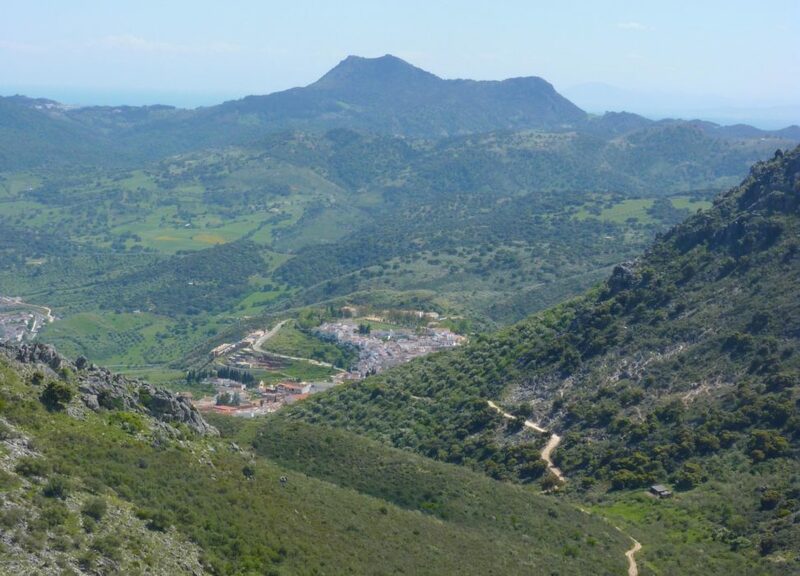 But meanwhile, I set out to explore the ancient byways and footpaths that connected the pueblos blancos or ‘white villages’ and climb the highest mountains that lay close to my base in Ronda. On clear days, from these high limestone peaks, the most wonderful vistas offer ample reward for your exertions earlier in the day. Out east the Sierra Nevada is clearly visible, to the south the Mediterranean stretches away towards the north coast of Morocco while, beyond the wine-growing lands that surround Jerez, tankers plying the ocean along the Atlantic Coast can be made out with the naked eye. After an exhilarating two weeks of hiking, I returned to my studies, invigorated after my Iberian adventure, vowing that I’d be back. Years later, having put faith in my instincts, I was living in Spain, working as a walking guide and writing guide books. Having hiked sections of the Camino de Santiago it was now time to explore the longer trekking routes in Andalucía. 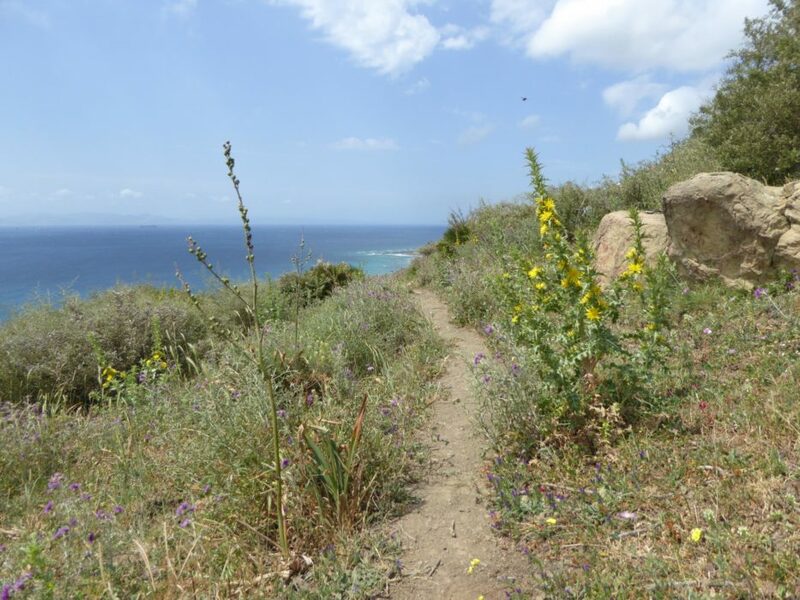 The GR7 – the Tarifa to Athens long-distance trail – was the obvious starting point, running for 1300km across the south of Spain in its northern and southern variants. And it was while walking the GR7 that the idea of an Andalucían Coast to Coast Walk was born. My original mission statement was to create a much shorter route than the GR7, one that could be covered in roughly three weeks of trekking and would link in the parks and reserves of the Baetic mountains, while passing through the region’s most beautiful villages. Beginning and ending each stage in a village would mean walkers could overnight in B&Bs, hotels and hostels, rather than having to carry camping gear: then, as they are now, campsites were few and far between. I wanted, at all cost, to avoid long sections of road walking and to search out the most beautiful footpaths and farm tracks even if following them added on a few kilometres to any given leg of the walk. I decided that each leg should not exceed 30km in length: in my experience this was about the maximum distance that can be enjoyably covered in the Andalucían mountains where even in spring and autumn temperatures can be as high as on an English summer’s day. I first needed to decide whether to walk west to east, or vice-versa. I soon realised that an east to west route made better sense: this would mean that for the greater part of each day the sun would be on your back rather than in your face. I also liked this option when seen in the context of Spain’s timeline. This was a country that for millennia had been trading with other Mediterranean civilisations, while it was only much later that the Atlantic, with the opening up of trade routes to the Americas in the 16th century, would offer it a leading role on the world’s stage. When researching the route and the history of the villages through which it passed, it was hugely inspirational to consider that so many ancient people, from prehistoric times onwards, had passed through these same mountains. There are few things that can connect us to our ancestry as walking an ancient footpath. 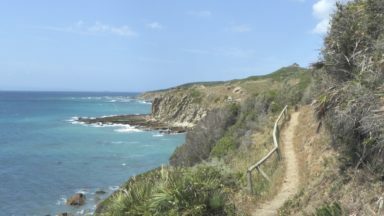 When it came to the trail’s end point on the Atlantic Coast, I knew from the start that this would have to be Bolonia and its beautiful arc of sandy beach, far away from the tourist resorts. 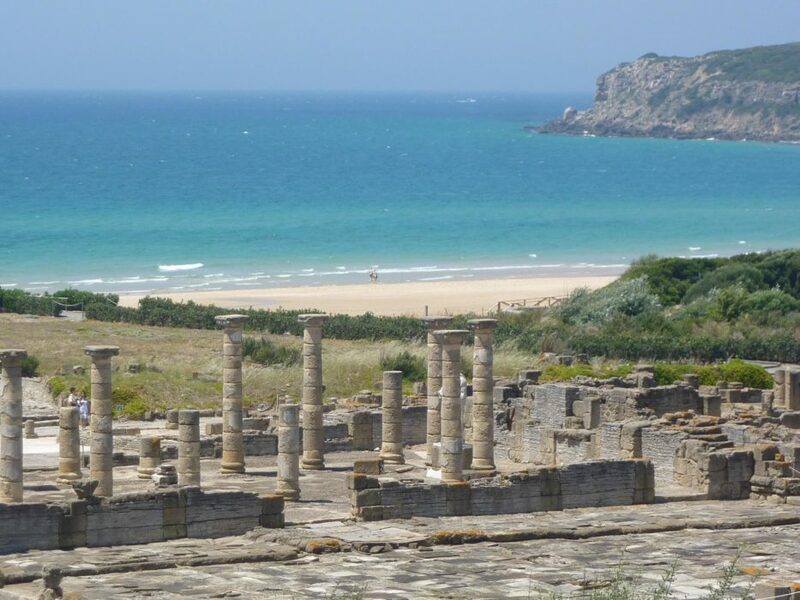 This sleepy ocean-side settlement is backed by the ruins of Baelo Claudio, one of best-preserved yet little-known Roman sites in Iberia. East of Málaga the choice of a start point proved to be more tricky before I discovered the pretty village of Maro, a few kilometres east of Nerja. Maro beach is another tiny arc of sand surrounded by high cliffs, with a mountain track cutting due north into the heart of the Sierra de Almijara. 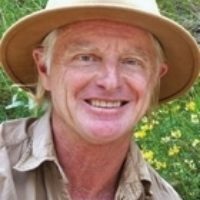 I first walked and charted the connecting route from Maro to Bolonia a dozen years ago. In those days there was little information available on the internet and waymarking was almost non-existent, apart from that of the GR7 and a few local footpaths. So, my first point of reference was the old Spanish military maps that had been compiled when locals were still walking the footpaths and drovers’ paths that connected the different villages. In town halls I was able to find more detailed maps, while quickly coming to realise that, when it came to asking the way or where a particular footpath began or ended, the older the person I asked the more likely it would be that they’d know. They were part of a generation that had grown up walking to local markets, at a time when public transport was virtually non-existent in Andalucía’s mountainous interior. There were many occasions when what appeared to be a clear footpath on a map ceased to exist, ploughed back into the land in order to create a few extra square metres of olive or almond grove. And several times I walked for many kilometres along a beautiful path only to come across a locked gate barring what I knew from my maps to be a bona fide right of way. Local farmers could be capricious in protecting their farms across which these ancient byways passed, thanks to one simple fact: virtually nobody was walking them anymore. Who was going to complain if a path was cut? In spite of some frustrating days and doubling back, the magic line of the walk gradually fell into place and after about a year of research I’d mapped a 21-day, 430km walk through the mountains from the Mediterranean to the Atlantic. Some sections coincided with the GR7 and since writing my original version of the guide other GR routes have been created. Many villages have woken up to the fact that walking tourism is here to stay and that by creating a waymarked network of local footpaths they can attract many visitors. In total, the Coast to Coast Walk leads through seven protected parks and reserves. 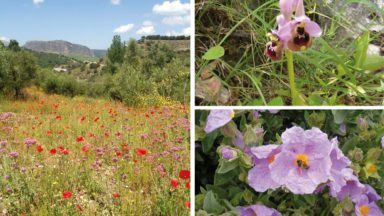 Leaving Maro and the Mediterranean, for the first five days the walk skirts the southern flank of the Sierra de Tejeda, Alhama and Almijara as you pass through the sub-tropical valleys of the Costa Tropical. Avocados, loquats, vineyards and stands of citrus gradually give way to groves of olives as you walk west. Passing through Frigiliana, one of the region’s prettiest villages, the trail runs beneath the mighty Maroma, which rises to more than 2000m, just 20km from the sea. 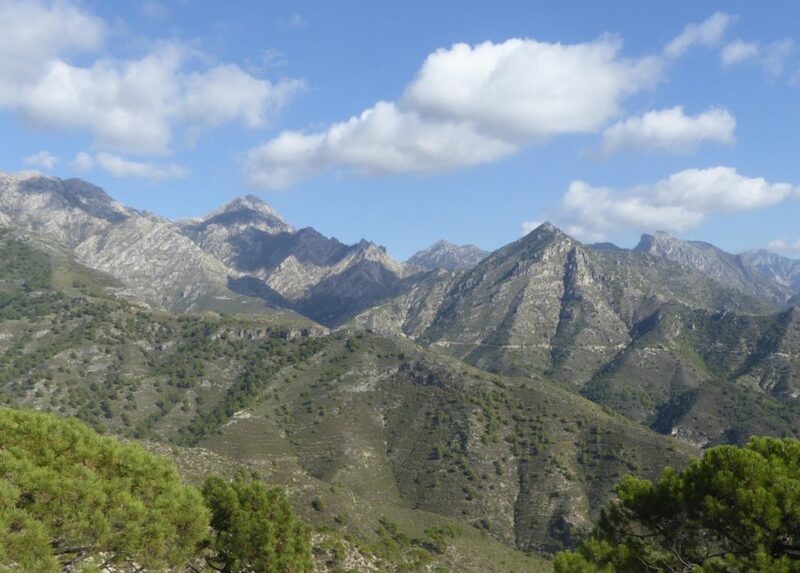 Approaching the western end of the Sierra, the next range of mountains comes into view, directly north of Málaga. 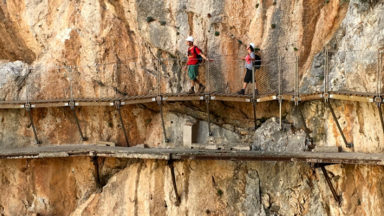 It’s here that you descend into the Chorro gorge where the extraordinary walkway of the Caminito del Rey clings improbably to a sheer cliffside. 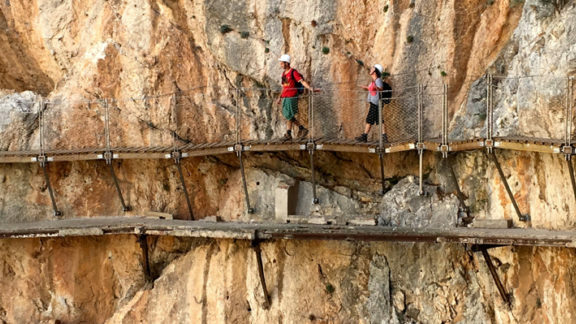 It’s worth setting time aside to walk this dizzy footpath: it has become one of Andalucía’s most popular tourist attractions since extensive restoration work took place a couple of years ago. But that’s only if you have a head for heights. When inaugurating the walkway in the late 1920s – the hanging footpath gave access to the hydroelectric power station installations above the Chorro reservoir – King Alfonso XIII was invited to see firsthand this remarkable feat of derring-do. Since then the walkway has born his name. 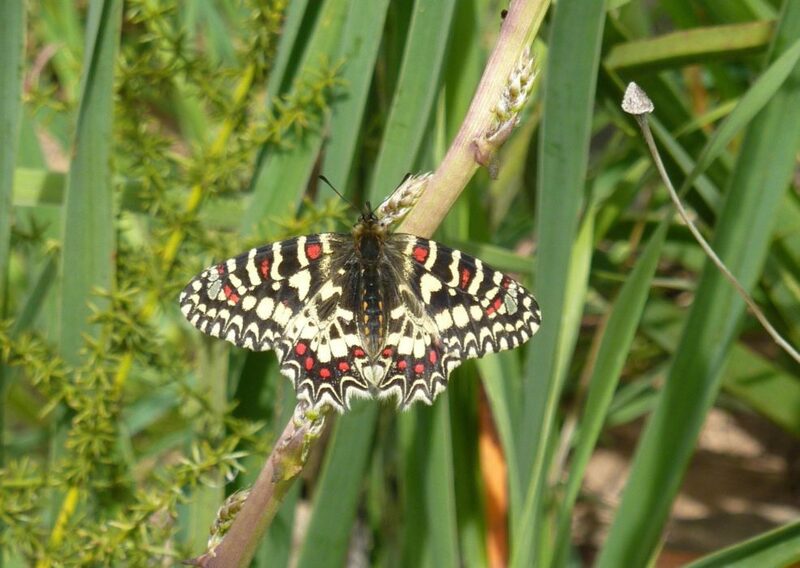 Two days west of El Chorro you reach the Parque Natural de la Sierra de las Nieves. A UNESCO biosphere, this pristine area will soon become a national park with the additional kudos and protection that this designation confers. Here you pass through wilder terrain as fields of wheat and olive groves are replaced by pine forest and stands of evergreen oak. After a long climb up and over the Lifa pass, Ronda comes into view, one of the highlights of the Coast to Coast Walk and one of Europe’s most spectacular urban inventions. 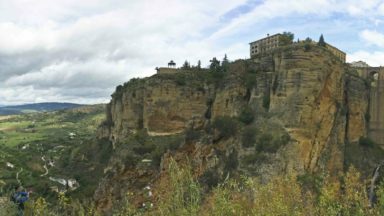 At this stage you’ve covered a little over half of the route and you might be tempted to break the journey and spend a second night in Ronda in order to explore its many mansions, churches and the old Moorish citadel. After almost 250km of all-but deserted mountain tracks and footpaths, the number of tourists around its famous gorge, bridge and bullring may come as a shock to your system. But by early evening the coach parties are returning back down to the crowded resorts of the Costa del Sol and this is the time to wander the labyrinthine streets of its ancient town centre and sip a sundowner at one of its cliffside hotels or restaurants. Beyond Ronda the axis of the walk swings south as you follow the eastern edge of the Parque Natural de Grazalema. Here you pass through some of the prettiest of the pueblos blancos to reach the Parque Natural de Los Alcornocales. As its name implies, this region is home to one of the largest stands of cork oak, Quercus suber, in Europe. The trees are particularly memorable in the months following the cork harvest when their russet-red trunks take on the appearance of gloved hands beneath the higher, unstripped branches. 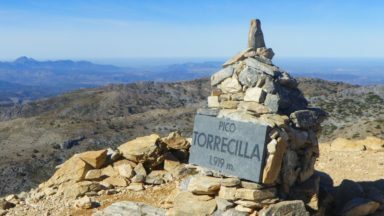 Here the Coast to Coast Walk coincides with sections of the recently marked GR249, also known as the Gran Senda de Málaga, which describes an 800km loop through the most beautiful parts of the province. 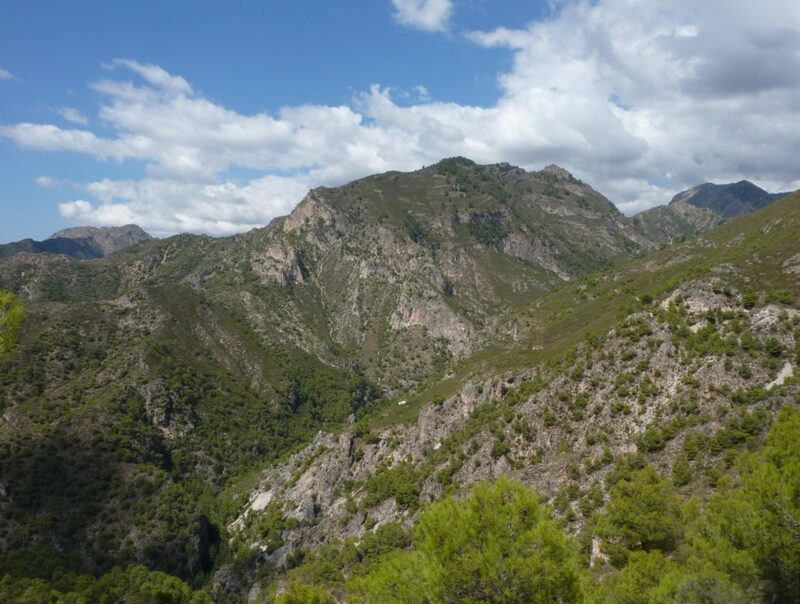 Shortly before you reach the sleepy railside settlement of Colmenar, the route skirts the high cliff edge of the Cañón de las Buitreras, another spectacular gorge carved out by the Guadiaro river, where you’ll be treated to the sight of dozens of griffon vultures riding the thermals, which rise up the vertical cliff faces. Descending towards the village you pass by a series of idyllic rock pools where, even in the cooler months, it’s tempting to take a refreshing dip. Another day of wild walking through more ancient stands of cork forest – here you’ll almost certainly see deer bucking away through the forest’s dense undergrowth and eagles circling overhead – takes you back into the Guadiaro valley, where you pass through the riverside village of Jimena de la Frontera before climbing to the mesmerising hilltop settlement of Castillo de Castellar. 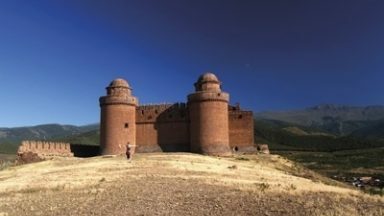 You shouldn’t miss the opportunity to overnight in the stunning Castillo Hotel, housed within a 13th-century Arab fortress, where most rooms have vast views out across the surrounding countryside. Like many of the 4-star hotels you encounter along the way, the cost of overnighting won’t cost much more than it would at a B&B in the UK. From Castellar, the Bay of Algeciras, Gibraltar and the north coast of Morocco are all visible as you begin the final days of the walk, which take you across the southernmost reaches of the Alcornocales park with its unique canuto ecosystem, born of the temperate, moist conditions of its steep-sided gorges. Beyond Los Barrios you once again reach the Mediterranean after 20 days of walking before, crossing Tarifa’s narrow isthmus, you drop down to the Playa de los Lances beach and the Atlantic. From here the final leg of the walk sticks close to the ocean’s edge where hundreds of kitesurfers will be cutting through the waves, blasted along by the levante winds that are funnelled through the Strait. 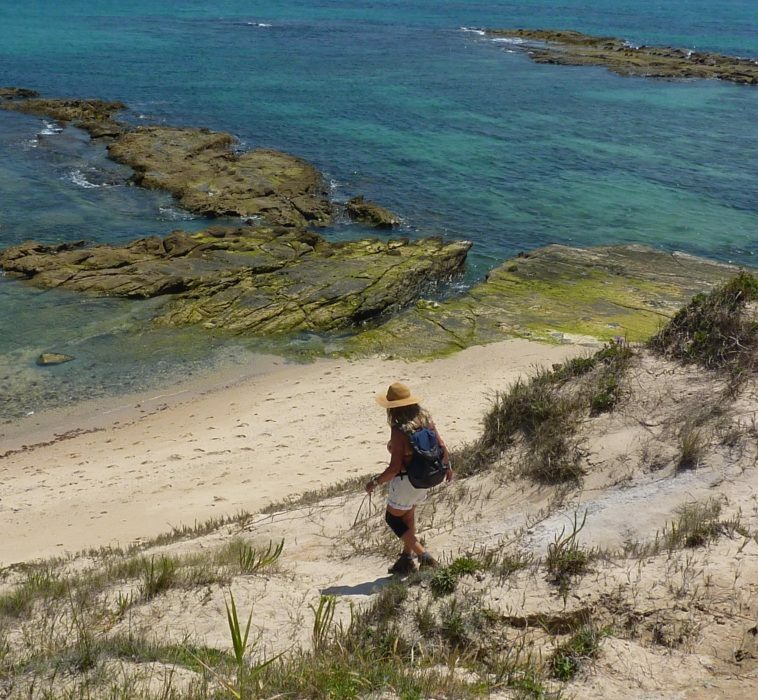 Crossing a low headland, you finally reach Bolonia, the end point of the Coast to Coast Walk. After 430km of incredible coastal and mountain walking, you might be tempted to celebrate completing the trail with fish fresh from the ocean and a chilled bottle of wine at one of the village’s beachside bars and restaurants.